Okay, so the same people behind the awesome ‘Splosion Man just came out with their first Kinect game, the Gunstringer. 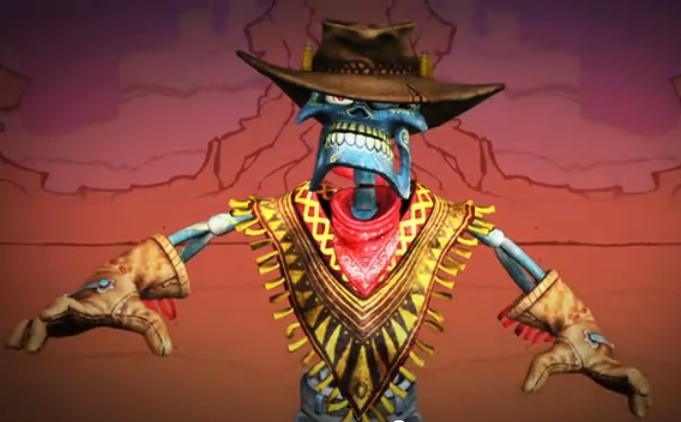 It’s a goofy, totally cheesed-out rail shooter based on Wild West marionette shows…no, really, that’s what it is. With your left hand, you control the movement of the puppet, the titular main character, and with your right, you aim and make shooting motions to shoot. It’s extremely simple, but also loads of ridiculous fun, and I love, love, love, love, the game setting – the entire thing takes place during a Wild West marionette show in a local theater, so every so often, you’ll get a glimpse of the audience (all real-life people), hear their reactions, listen to their cheers, and see the chief puppeteer’s hand as he drops obstacles in your way. We’ll how the whole play experience is, but so far, 2-3 stages in, I can’t get enough of this game. Also, as a nice bonus for a $40 game, Twisted Pixel threw in a free copy of Fruit Ninja Kinect, normally available on XBLA for $10. Now, I had played Fruit Ninja on an iPad before, and it was loads of fun swiping your finger back and forth frenetically trying to kill the fruit. For the kinect version, Halfbrick studios added a further twist – the kinect portrays your “body” as a shadow against the game background, and to slice fruit, you move your whole arm quickly in a slicing motion. I don’t know whether it was because I played it non-stop for an hour, or simply that I’m totally out of shape, but the change makes all the difference. There is no better game out right now for the Kinect that is guaranteed to have you and your friends putting one another in mortal danger as you flail wildly in the generally direction of shiny visual cues that look (and slice) like fruit. It took far too long, but the Kinect just picked up two excellent-seeming titles, both of which have multiplayer, and if my own experiences continue for the rest of the games, would make them well worth the purchase.